In maths, there’s a pattern called a fractal. According to Wikipedia, it’s a “repeating pattern that displays at every scale”. The idea is that any slice of the fractal becomes a smaller mirror of the whole picture. One day could stand for a whole lifetime. One game could stand for a whole season. Today, as the wind howled, and Reece Burke corralled another ball forwards, and that green (5p) plastic bag continued to swirl amidst the driving rain, and a white shirt careered into yet another semi-legal challenge, and the referee blew once more, and the game set into its last 15 minutes, City stood two thirds of the way through their own story of the season. A scrappy start, both sides scrabbling for a genuine foothold, had moved into a period of more defined dominance. But there was still something missing. Like in January, a personnel change was required. And with a quarter of an hour still on the clock, Phil Parkinson made a substitution that may be looked back upon as the most pivotal in-game decision of Bradford City’s late promotion surge, swapping Jamie Proctor and Billy Clarke simultaneously for James Hanson and Steve Davies. Exactly five minutes later, James Meredith will win a throw-in just beyond halfway. Kyel Reid will stand within close range, and Billy Knott will move down from midfield to offer a further option. But it is Nathan Clarke, cantering forwards from the back, who will provide the match-winning assist. Meeting Meredith’s throw, Clarke sets himself up for a side-footed—half-volley and hands the newly-introduced (and free in acres of space) Davies the easiest goal he’ll score all season. Davies runs to the Kop, soaking up the adulation; Clarke runs back to Burke, Darby and McMahon, elated. The fractal graph curves upwards, as 90 minutes mimics the trajectory of Bradford City’s whole season. For the most part, this was no vintage performance, from either side. City didn’t match the heights of their display against Doncaster two weeks ago, but today’s slender lead proved enough to cement their position in the play-offs going into the second round of Easter fixtures. With Millwall continually seeking to stop play, both sides entered the break having failed to attain any real momentum. Credit to them, the Lions had done their homework, trapping Proctor with a towering back four and doubling up on Billy Clarke when the City striker made a run into the final third. There will have been few individual battles grizzlier than the one between Clarke and Millwall’s holding midfielder Shaun Williams today. With Lee Evans and Josh Cullen away for U21 duty, it was a first home appearance for Billy Knott since the 2-2 draw with Rochdale, and a Bantams debut for on-loan Rotherham centre half Tom Thorpe. Playing as a deep-lying midfielder, Thorpe had a quiet first half, perhaps the biggest victim of the staggered feel to the opening 45. Knott put in a workmanlike display and was vital in keeping things ticking over in the middle of the park; Thorpe was solid, if unspectacular, but lacked the distributional range that made Liddle and Knott the dominant partnership of 2014/15. To that end, you wonder how much the success of City’s play off surge hinges upon the use of two attacking midfielders. Knott and Evans have played well together at times this season, but Josh Cullen’s technical astuteness and vision was what, really, enabled this side to reach the next level. Playing alongside Evans, Cullen combined technicality with composure to consistently raise the Bantams’ ceiling, with Evans proving vital in recycling possession alongside the West Ham loanee. Today, Thorpe was in contrast less mobile, and Knott repeatedly lacked outright support alongside him to leave the Bantams lopsided in the centre. Thorpe was often static, though most likely hindered by the lack of recent game time. Things took on a more fluid feel in the second half. Proctor bundled home from close range after meeting Billy Clarke’s lay-off, but the offside flag was duly raised. Meredith and Reid worked tirelessly on the right, but Millwall’s back four were standing firm. It was here Phil Parkinson, exhibiting the trained hand of a poker player, was reimbursed handsomely as he made what would turn out to be the game-winning substitution. Recognising City were coming up short in the middle and needed a bit more grit against a combative, bullish, robust Millwall side, Parkinson threw Davies and Hanson into the midst of the battle and took of his most potent attacking threat of late in Jamie Proctor. With Davies holding a high line, Hanson dropped deeper and wider, adding another body to the centre while concurrently unstitching the visitors’ back four. As Nathan Clarke’s lofted delivery fell within touching distance of the six-yard box, Steve Davies was away – but it was thanks, in part, to James Hanson. This has been no classic campaign for Hanson – perhaps the first in which he has faced sustained and meaningful competition that has unseated his role as a surefire starter. Proctor is more readily accommodative of Billy Clarke, but Hanson continues to have a role in this team. Whether today’s 15 minute spell was enough to warrant changes for Monday is another question and probably more dependent on how Parkinson’s midfield shapes up. Nevertheless, that Hanson and Wes Thomas were lauded as the pairing to get this team promotion just over a month ago and are now out of the immediate picture speaks volumes about the depth of viable striking partnerships Parkinson finally has at his disposal. A stomach-churning final ten aside – Ben Williams with the two obligatory worldie saves that are now as indelible a part of this team’s identity as a Reece Burke jaunt forward, a Kyel Reid row ZZ missile and perfectly-angled Rory McArdle diagonal ball – and City had their third win in four. Four goals in his last six appearances for Steve Davies, the Bantams now sit two points ahead of seventh-placed Barnsley, with just eight games of the season left to go. The final two players to leave the pitch today – quite literally soaking up the applause in the downpour – were Nathan Clarke and Tony McMahon. If any two players sum up the development arc of this team, it’s this pair. McMahon endured a staggered first few weeks, trudging away at the base of a diamond as play passed him by. Clarke looked to be laden with the hangover of Leyton Orient’s relegation, low on confidence and repeatedly failing to get the basics right. Yet both have evolved to become lynchpins of this team, McMahon a Craig-Bellamy-meets- Mesut Özil-meets-David-Beckham assist king and Nathan Clarke the man who may just keep Rory McArdle out of this team. Clarke was outstanding today, the intelligence and boldness to burst forwards for the assist complementing yet another solid defensive performance. Once again, Parkinson’s back four has become the foundation of what could be his second promotion side, today’s clean sheet the 21st of the campaign for Ben Williams. Today was no textbook showing from City, but, over a weekend in which the other promotion contenders could have increased the gap, the Bantams succeeded where others stumbled – in picking up all three points. This win could be enough, but the challenges continue. 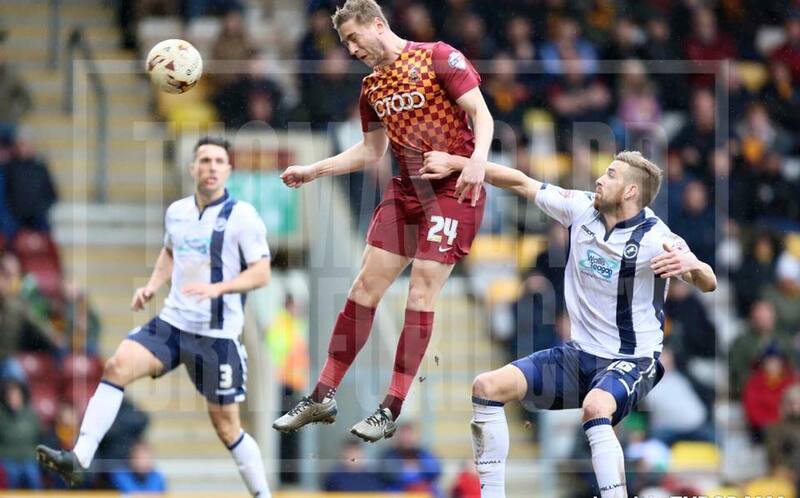 At the moment, Bradford City have the upper hand – but they have to stay there. The margins are becoming thinner and thinner, almost perilously so. There may not be room for another one or two slip-ups, another one or two bad days at the office. Every single player has to be a 7/10 from now until the end of the season – eleven man of the match performances every single game. Anything else could leave City in a position that might prove one step too far. Good article . However N.Clarke actually want over to take the thrown in for the Davies goal . However he did superbly well to cross a ball that was thrown at him at speed which he was no expecting.. I thought the wind was the winner, except that City used it better than Millwall. I was very disappointed in Millwall. They were above City in the league, on a good run, yet they came to defend, to stop City by any means, to waste time, and get a 0-0. or maybe get lucky. Their performance was summed up by their goalkeeper kicking downwind in the first half, kicking the ball dead for a goal kick 3 times, and kicking it straight to Williams 3 or 4 times. It was only when City scored that they tried to play , and were possibly unlucky not to equalise. They got what they deserved, and so did City. A special word for Reid. He ran miles, wasted a lot, but his attitude summed up City’s hard work. I thought Knott was excellent too. He kept prompting & driving them on when it looked like the winner wasn’t going to come. In memory of late lamented Johann Cruyff, a feast of total football??? Hardly! Was their “holding” midfielder no.6? the “kicking owt going over half-way” midfielder? Well observed Katie. Whilst maths was never my strong subject at school, I get the idea. Things even themselves out over a season and that seems to have been the case yesterday. City could count themselves unfortunate to leave Wigan pointless but they took the 3 points against Millwall when a draw was looking the most likely outcome. Had we taken a point from each of those games we may have been reasonably satisfied but hey, 3 points is better than 2. Most supporters seem to be obsessing on 6th place, however, I think 5th, or even 4th is achievable and should be the target. And so to Crewe. Not always a happy hunting ground for City but then the same could have been said for Peterborough and look what happened there! There was a lot at stake for both sides and the game reflected that. Interesting that after the Wigan game there was criticism about Parky’s subs, despite there being no evidence that it would’ve yielded a different result, yet there is no praise when he makes a change that gives us the 3 points. I thought Nathan Clarke was excellent and you can probably attribute his early season performances, due to not having a proper pre season after leaving Leyton Orient in the summer.